The volatile components of Citrus aurantium L. flowers were characterized by GC-MS with two different extraction techniques, hydrodistillation (HD) and ultrasonic-assisted headspace solid phase microextraction (UA-HS-SPME). In the SPME method, the volatile components of the samples, irradiated by ultrasonic radiation, were collected on a polydimethyl siloxane (PDMS) commercial fiber as well as some manually prepared nanoporous fibers from the samples headspace. To reach the better results, the extraction conditions were carefully optimized for the PDMS fiber. Under the optimized conditions (i.e. sonication time 15 min, extraction time 30 min and extraction temperature 55 ºC), 54 compounds were identified by the UA-HS-SPME-GC/MS method. The essential oil components of Citrus aurantium L. flower samples from two different regions of Iran and new and old samples from the same region were compared to one another. The major components identified for the samples with both the SPME and HD methods were linalool, linalyl acetate, limonene, β-myrcene, geranyl acetate, and neryl acetate, respectively. However, a substantial variation in the percentages of the components was identified for different samples and different extraction methods. The antimicrobial activities of the oil were also examined against six standard bacteria. There was some activity against Enterococcus fecalis, Escherichia coli, and Bacillus cereus, indicating important biological activities of the oil. A. Quintero, C.N. Gonzalez, F. Sanchez, A. Usubillaga, L. Rojas, Acta Hort, 597 (2003) 115–117. J. Santana, K.E. Sharpless, B.C. Nelson, Food Chemistry, 109 (2008) 675-682. G.K. Jayaprakasha, Y. Jadegoud, G.A. Nagana Gowda, B.S. Patil, Journal of Agricultural and Food Chemistry, 58 (2009) 180-186. D. Barreca, G. Lagana, E. Tellone, S. Ficarra, U. Leuzzi, A. Galtieri, E. Bellocco, Journal of Membrane Biology, 230 (2009) 163-171. M. Senevirathne, Y.-J. Jeon, J.-H. Ha, S.-H. Kim, Journal of Food Engineering, 92 (2009) 157-163. H.S. Wagner, L. Deut, Deut Apothek-Ztg 113 (1973) 1159-1166. T. Komori, R. Fujiwara, M. Tanida, J. Nomura, M.M. Yokoyama, Neuroimmunomodulation, 2 (1995) 174–180. MI Carvalho-Freitas, M Costa, Biol Pharm Bull, 25 (2002) 1629-1633. B. Delaney, K. Phillips, D. Buswell, B. Mowry, D. Nickels, D. Cox, HB. Wang, J. Manthey, Food Chem. Toxicol, 39 (2001) 1087-1094. K. Fisher, C. Phillips, Trends in Food Science & Technology, 19 (2008) 156-164. D. R. Caccioni, M. Guizzardi, D. M. Biondi, A. Renda, G. Ruberto, Int J Food Microbiol 43 (1998) 73-79. L. Giamperi, D. Fraternale, D. Ricci, Essent. Oil Res, 34 (2002) 21-28. Pultrini Ade M, Galindo LA, Costa M, Life Sci, 78 (2006) 1720–1725. L. Mondello, A. Casilli, P.Q. Tranchida, L. Cicero, P. Dugo, G. Dugo, Journal of Agricultural and Food Chemistry, 51 (2003) 5602-5606. G. Rubero, P. Rapisarda, J. Food Sci, 67 (2002) 2778. P.J. Marriott, R. Shellie, C. Cornwell, Journal of Chromatography A, 936 (2001) 1-22. A. Hognadottir, Russell L. Rouseff, Journal of Agricultural and Food Chemistry, 998 (2003) 201-211. H.S. Choi, M. Sawamura, Journal of Agricultural and Food Chemistry, 48 (2000) 4868-4873. C.B. Tirado, E. E. Stashenko, M.Y. 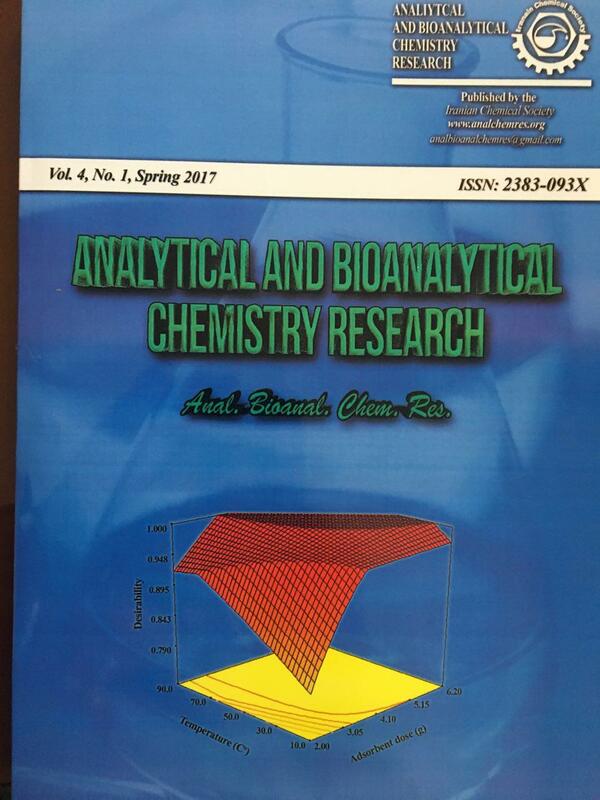 Combariza, J.R. Martinez, , Journal of Chromatography A, 697 (1995) 501. I. Bonaccorsi, D. Sciarrone, L. Schipilliti, A. Trozzi, HA. Fakhry, G. Dugo, Nat Prod Commun 6(2011) 1009-1014. G.R. Talei, Z. Mosavi, Asian J. Chem, 21 (2009) 4749-4754. C.R. Mahon, D.C. Lehman, G. Manoselis, Textbook of Diagnostic Microbiology, Chapter 13 Antimicrobial susceptibility testing by Fredric J. Marsik, 4thed, W.B Saunders Elsevier Company, (2011) 276 – 329. A.R. Ghiasvand, M. Nasseri, S. Farsizaeh, M. Meshkatalsadat, R. Sadeghi, Sh. Shadabi, M. Borzoei, Chromatographia 73 (2011) 1031–1035. D.A. Lambropoulou, T.A. Albanis, Journal of Chromatography A, 993 (2003) 197-203. E.H. Graven, L. Webber, G. Benlans, M. Venter, J.B. Gardner, J Essent Oil Res, 3 (1991 ) 303-307. A. Gil, C.M. Ghersa, S. Leicach, Biochem. Syst. Ecol, 28 (2000 ) 261 -274. Saima Siddique, Muafia Shafique, Zahida Parveen, S.J. Khan, R. Khanum, ( 2011) 499-507. M. Sokovic, J. Glamoclija, P.D. Marin, D. Brkic, L.J.L.D.v. Griensven, Molecules, 15 (2010) 7532-7546. P.V. Gopal, Pharmacia, 1 (2012) 107-109.